Millions of devotees throng the Tirumala Hills practically round the clock throughout the year for having darshanam of Lord Venkateshwara . It is always the darshan what he gives us than what we seek . Many will share their experiences having darshanam with moist eyes . However , Very few are aware that when we walk inside the temple , to the right side of the Main entrance we can see a crowbar tied to the wall which has a glorious past . As we move towards the sanctum sanctorum of Lord Venkateswara , how many will remember that there was a time , just a thousand years back, when the Hills were deserted with not much of human habitation in sight . 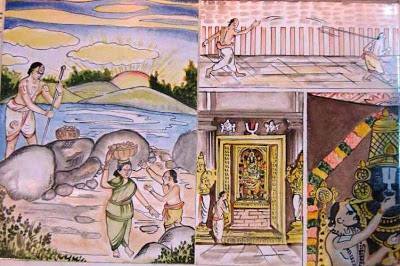 Swamy Ramanuja had visited the Hills thrice. 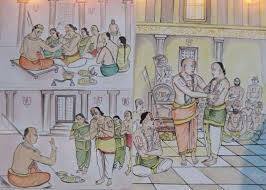 His maternal uncle , Peria Thirumalai Nambi gave him discourses on Srimad Ramayana for several months at the Hills. The temple and the surroundings were in bad shape and worship was not organized regularly. Swami Ramanuja was inspired by the Holy Hymns of the Alwars singing the glory of the Lord of the Seven Hills. Swami Ramanuja put it to the concourse of disciples hearing him on Bhagavad Vishayam. ”Srirangam is known as Bhoga mantapam, the place where Lord enjoys Himself at the sight of the devotees on the banks of the river Cauvery. 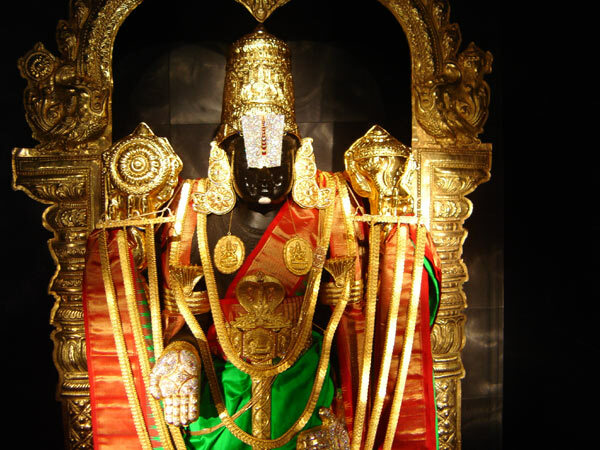 Kanchi is known as Tyaga mantapam, where the Lord sacrifices for the sake of his devotees. The Thirumalai Hill is known as Pushpa Mantapam where the Lord is bedecked with flowers all the time. We should lay a garden for the service of the Lord and see that flowers are arranged for daily worship . Is there anyone……………… he posed them the question ……………whether any one of them will take up the task of serving the Lord on the Hills on a day to day basis. Everyone was hesitating , fearing the hard life up the Hills what with wild animals and the insects in the forests. Beloved Acharya ! Bestow the blessing of serving the Lord of the Seven Hills on this humble self. Anatharya chose to settle down on the Hills in fulfillment of the command of the Guru As per command, he climbed up the sacred Tiruvenkata Hills, laid a garden and dug a tank and a lake for the service of the Lord to ensure perennial supply of flowers. This was at a time when nobody dared to go up the Hills because the risk involved of difficulties associated with life on the Hills. Admiring his dedication , Swamy Ramanuja gave him the title ”Aanpillai “(the great man) He therefore came to be known as Anantanpillai. One day Ananthalvan and his wife were digging the earth for creating a small pond for the new garden. The only thought in their minds was that that was a service dear to the Acharya Ramanuja. This time, Ananthalvan’s wife was in the family way and still, despite her physical frailty, was helping her husband with all dedication..
She was carrying basketloads of mud as per the instructions of Ananthalvan and throwing them at a far distance. Lord Srinivasa was unable to bear the pain being undertaken by the lady and was moved by her devotion to the cause. “Oh Acharya, you have grown old……………………………..
You are not in a fit condition to dig earth up. Your wife is also in full period of pregnancy and she will not be able to carry basket-loads of mud. Please give me the spade. Let me help you in this task. I will dig the earth up and carry the basket-loads on my head. I will drop them at your desired place. The old couple that you both are may watch me and guide in this task”. Ananthalvan heard the youngster and replied to him,” My dear young man, you are looking handsome and soft. You are full of ornaments and you are not able to carry even the weight of the ornaments on you . People like you are born delicate and will not be able to undertake arduous task of digging the earth and carrying the mud. You will be put to physical strain. This is a task which you cannot do. On the other hand, I am fit for this rough and tumble earth work. I will be put to strain if I do not do this job. Please do not interfere. If you want to render service to the Lord, you may do it separately elsewhere . I will drive you out you with this tool . The Youngman was taken aback at the wrath of Ananthalvan, and for a moment stayed aloof. However, after sometime, he saw the lady carrying the basket full of mud and walking slowly with infirm steps. He accosted her on the way and spoke to her sweetly taking away the basket of mud on his head. Thus the lady was able to hand over the basket of mud to the Youngman who in turn left it at the particular place. Ananthalvan found the work being done in half the time hence questioned his wife whether she was throwing the mud at nearer place instead of the appointed place. She told her husband how the young brahmachari was helping her by preventing her from reaching the destination and taking away the basket from her thus doing the job himself. Ananthalvan grew red in the face. He, overtaken by rage, ran after the youngman with the crowbar. He cried out to him” oh unknown youngster, you continue to interfere with my service in spite of my warning. You will pay for it”. The young man climbed up a big banyan tree and hid himself among the leaves. ” My dear Ananthalvan, spare me. I have rich diamond and golden ear-rings. My garment is of golden tissue. I will give you all these things if you spare me”. “Let him climb down and start running as soon as he believes me. I will catch him then……. ”So he told the lad,” All right I will leave you alone. You may come down. “The boy jumped down from the tree and started walking briskly even while turning his head backwards to see if any body was following him. A few minutes later he found that Ananthalvan was chasing behind in order to catch him. The young lad started running ……. Being unable to catch him, Ananthalvan unknowingly threw the tool which he had used to excavate the soil …..( crowbar) at him. The tool hit the divine lad on his chin and he was profusely bleeding. However, with the bruise , he vanished into the temple, closing the door behind him. Ananthalvan waited for the boy to emerge from the temple. There was no trace of the temple door opening. The priests came to the temple for the evening Puja. Ananthalvan told them how the young lad had entered the temple and closed the door from inside. The priests shouted at the boy to come out of the sanctum sanctorum and open the door since it was time for the evening Puja. 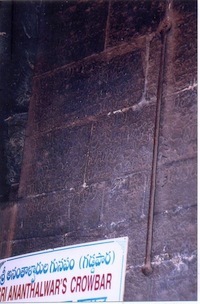 Ananthalvan, the priests and other devotees entered the sanctum sanctorum. There was no trace of the boy. He was all smiles, from His beauteous chin blood was oozing out. Shocked at the spectacle of blood oozing out of the Lord’s chin, Ananthalvan wondered how this could happen and prayed to the Lord for an explanation. 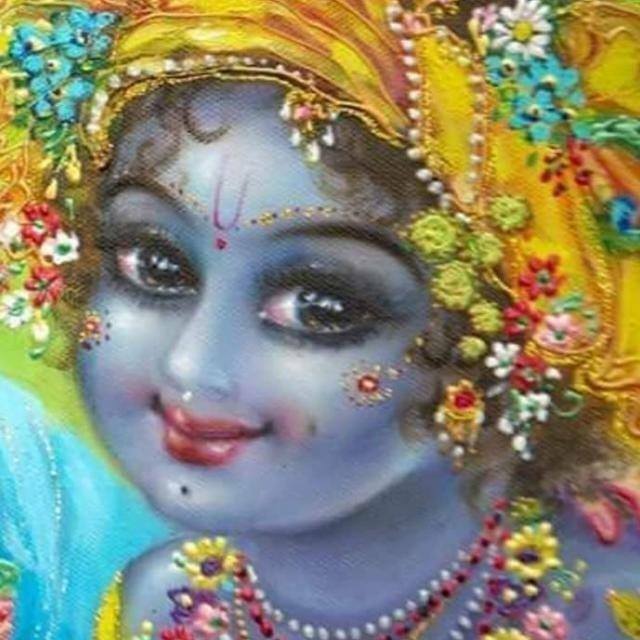 The Lord answered his prayers and told him,”My dear Ananthalvan, I wanted to partake of the service you were doing for me and for the devotees. You would not allow me to join you in the service. You were after me in rage and threw the crowbar at me which hit me on the chin. Ananthalvan was awe-struck and in fear begged of the Lord for forgiveness for what he did. He applied herbs and stopped the flow of blood. I am delighted at your complete dedication to my service. You will have the Sesavastra ( adorned clothes ) , the diamond studded ring and the golden ear-ring as honours from me”. Even to this date, the crowbar with which Ananthalvan injured the Lord is hung at right side of the entrance to the main gate of the temple and the Lord is adorned with Pacchaikarpura on the chin. This is distributed to the devotees as Sripadaremu. 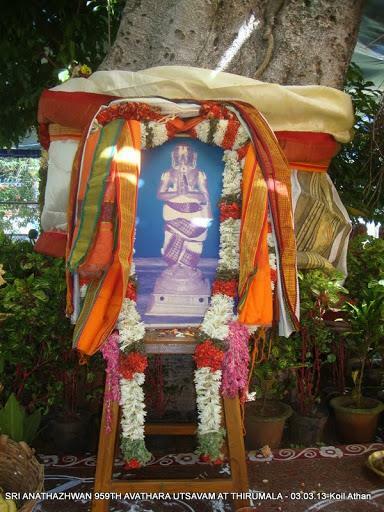 Swamy Ananthalvan served LORD and breathed his last at an age of 84 years . There is an Ananthalvan Vrindavanam on the Hills in the Ananthalvan garden. There is also a Makila tree (vakula) in the garden. According to tradition, it was on the Tiru Adi puram day (July-August ) that Swamy Ananthalvan reached Acharyar’s lotus feet .. Even today Lord Srinivasa with his Consorts comes in procession to the garden on the evening of Tiruvadi Puram and maha prasada is offered on that occasion. 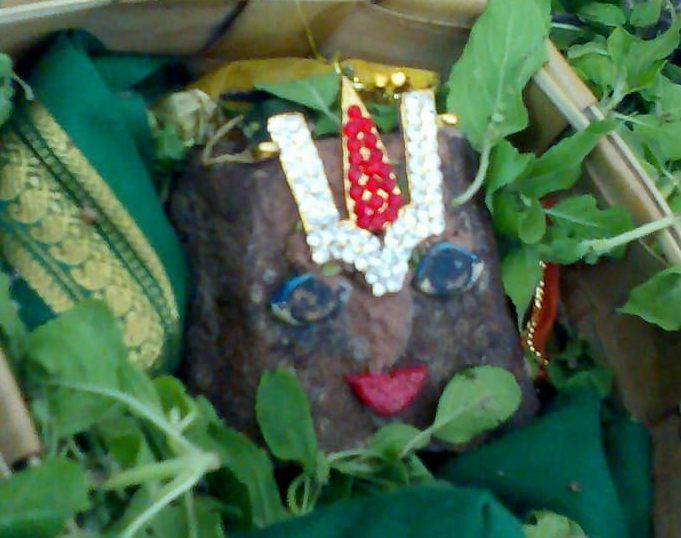 At the time of His return, the Makila tree is offered with flowers from the Lord and also Sri Sathakopa. 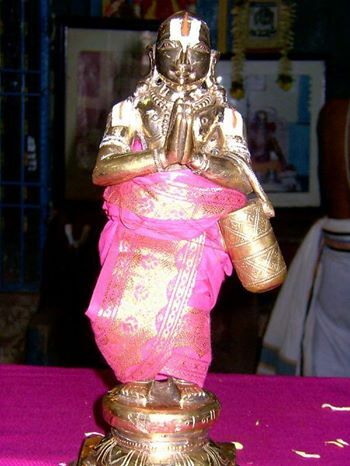 Outside the Swamy Ananthalvan ThiruMaligai (the house wherein Ananthalvan resided), the Sri Sathakopa is bathed in holy water (Tirumanjana) and Lagu Samproksanam takes place. The Archaka goes to the Svami Puskarini for bath. This tradition which is carried on even today shows that the Makila (Vakula) tree is probably Swamy Ananthalvan himself reborn on the Hills. You would not allow me to join you in the service. You were after me in rage and threw the crowbar at me which hit me on the chin. How can you forget it so soon?”Ananthalvan was awe-struck and in fear begged of the Lord for forgiveness for what he did. Thank you for sharing all this beautiful pastimes. Very touching, i feel i was born on the wrong side of the Earth, when i am reading this 🙂 . Hare Krishna! All Glories to His Divine Grace Srila Prabhupada who brought Light to west. I have no words to express other than to say I am enlightened. Thank U so much Sir for the information,inspite of so many trips me and my family had made and entered the sanctum sanctoriam we had never noticed this and regret for this,hope God will help us during our next trip . A nice pastime which also highlights the relationship of the disciple with the spiritual master. By the mercy of the spiritual master one receives the benediction of Krsna. Without the grace of the spiritual master, one cannot make any advancement. Therefore, I should always remember and praise the spiritual master. At least three times a day I should offer my respectful obeisances unto the lotus feet of my spiritual master. Hare Krsna prabhuji for posting such nice pastimes. Very interesting to read about the great follower of Lord Thiruvenkatadamudaiyan and the blesings of the Lord and invoking his blessngs to one and all. You have posted this article just before the Celebration of Sri Ananthalvan function to be held at Tirumala on Sunday,22nd February,.Thanks for the valuable information. Adiyen … Yes .. When we worship LORD knowing about his ardent devotees the feel is special and everlasting ..
Nice post – I already heard this story but clearly known this today. JAI SRIMAN NARAYANA….THANK YOU SWAMI…. I’m feeling blessed now by reading this article .my eyes were full of tears by reading about sri swamy varu .I’m so much thankful to you venkateswara swamy . Very interesting information. Thanks for uploading Ananthalwan story. Adiyen..! NICE.BLESSED TO KNOW INFORMATION ABOUT LORD.THANKS FOR THE POSTING.A HAPPY NEW YEAR. WISH U AND YOUR FAMILY THE BEST.